Students in New Jersey, ranging from grades 4-12 voted primarily via electronic ballots. 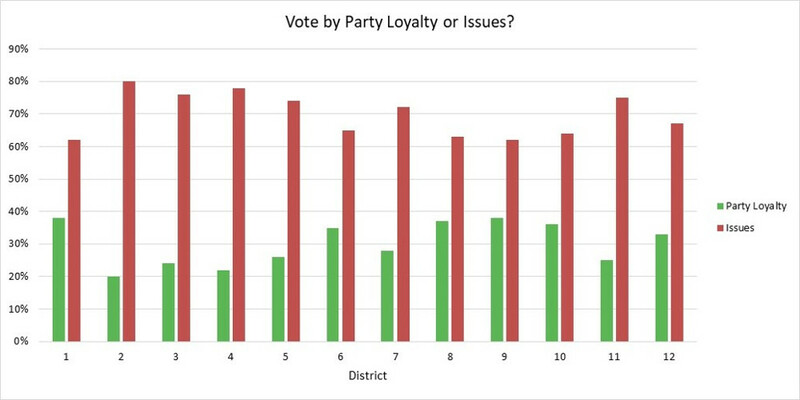 Students submitted votes for five categories: House of Representatives, Senate, whether they vote by party loyalty or by the issues, should President and Congress Be from the same or different parties, and whether or not the nation would benefit from the rise of a strong third party. Votes were received from students residing in each congressional district. These votes were tallied up to generate the result by Congressional District and by Grade. Students either submitted their ballots individually online or a representative from each participating school district collected the voting results and submitted them via an online form. In total, all 12 Congressional Districts participated, with a grand total of 24,468 students casting votes. 12,533 students were from grades 4-8, and 11,935 were from grades 9-12. Below is a table with the total students per grade. In each map, the color of the congressional district represents the candidate or issue stance that received the most votes. On House of Representative and Senate maps, red represents the Republican candidate and blue represents the Democrat candidate. On issue maps, green and red are used instead of party colors. Here is the final Senate results. Blue district means the Menendez received the most votes, and red means the Republican representative received the most votes. The yellow buttons can be clicked on to see total percentages. Here is the final Senate results. Blue district means the Democrat representative received the most votes, and red means the Republican representative received the most votes. The yellow buttons can be clicked on to see total percentages. We asked the students three opinion questions: 1) Do you vote by party loyalty or by candidate and issues, 2) Is it better for Congress and the Presidency to be of the same party or different parties, 3) Would the country Benifit from the rise of a third party? 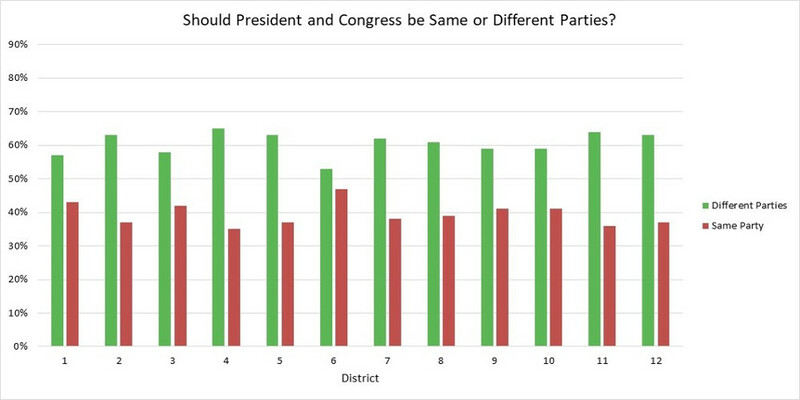 Below are charts showing results by Congressional District of all three questions. Students in New Jersey, ranging from grades 5-12 voted primarily via paper ballots. Students submitted votes for four categories: Governor, Senate, General Assembly, and where they got their news. 85% of the students submitted votes for all four categories. The remaining 15% only submitted votes for the gubernatorial candidates. Votes were received from students residing in 18 of the 40 Legislative Districts. The missing districts are not shown in the reporting tables. A representative from each participating school district collected the voting results and submitted them via an online form. In total, 25 school districts across NJ participated, with a grand total of 14,056 students casting votes. 6,846 students were from grades 5-8, and 7,211 were from grades 9-12. Here is the final Governor results. Blue district means Murphy/Oliver received the most votes, and red means Guadagno/Rendo received the most votes. The yellow buttons can be clicked on to see total percentages. Here is the final General Assembly results. Blue district means the two Democrat representatives received the most votes, red means the two Republican representatives received the most votes, and purple means a representative from each major party received the most votes. The yellow buttons can be clicked on to see total percentages. Here is the news source results. Students were asked to select all the news sources they use from the following list: printed newspapers, newspapers via their websites, other websites, social media, and broadcast media. 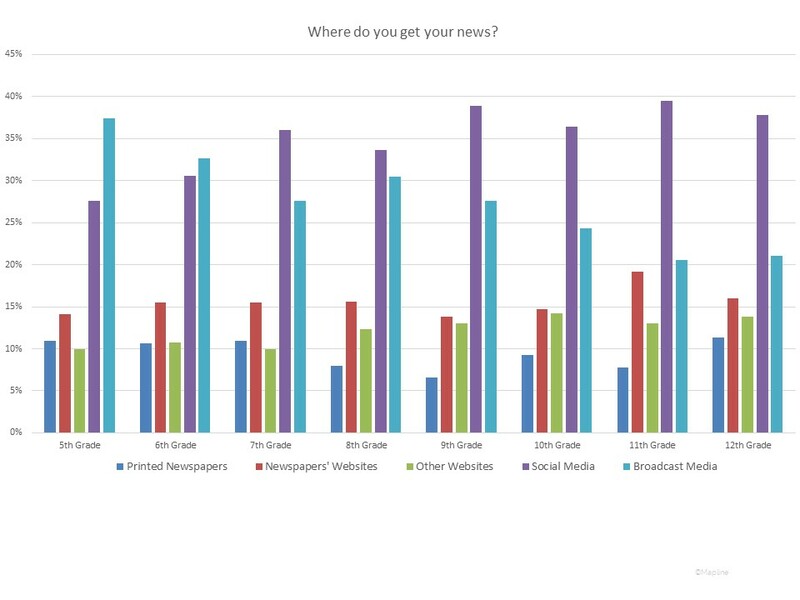 The chart below is broken down by grade, showing the percentage of students within each grade that used a particular news source. Students in New Jersey ranging from grades 5-12 voted primarily via paper ballots. Students submitted votes for four categories: President, House of Representatives, whether or not NJ should enact a gas tax, and whether or not there should be term limits for Congressmen. 85% of the students submitted votes for all four categories. The remaining 15% only submitted votes for the presidential candidates. 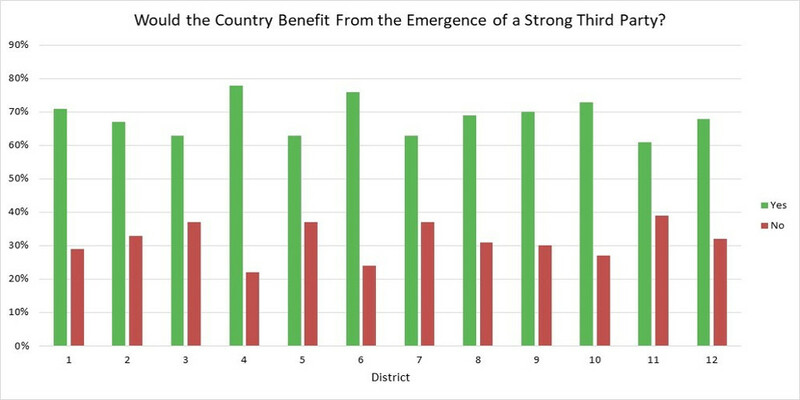 Votes were received from students residing in each congressional district. Additionally, votes were received from students residing in every county except for Atlantic, Salem, and Gloucester. These missing counties are not shown in the reporting tables. A representative from each participating school district collected the voting results. In total, 74 school districts across NJ participated, with a grand total of 65,696 students casting votes. Here is the final President results by District. Blue district means Clinton received the most votes, and red means Trump received the most votes. The yellow buttons can be clicked on to see total percentages. Here is the final results by District. Blue district means the Democrat representative received the most votes, and red means the Republican representative received the most votes. The yellow buttons can be clicked on to see total percentages. Here is the final gas tax results by District. Red means the majority voted “no” and and red means the majority voted “yes.” The yellow buttons can be clicked on to see total percentages. Here is the final term limits results by District. Red means the majority voted “no” and and red means the majority voted “yes.” The yellow buttons can be clicked on to see total percentages.